HOLD BACK THE DAWN (1941) --- I watch Hold Back The Dawn and ponder Paramount's industry dominance during the early forties when it was made. For a coming wartime attendance boom, this company was ideally situated thanks to record ownership of theatres. That meant taking home lion's share of the revenue boxoffices collected. 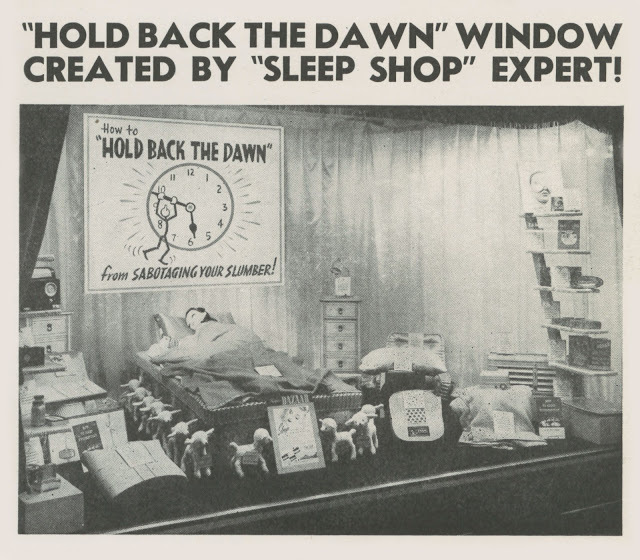 I'll bet Hold Back The Dawn was seen by more people than most shows that came out in 1941, just by virtue of Paramount controlling so much screen time. Extended runs were gaining ground by then, thus longer opportunity to see this and other major studio releases. 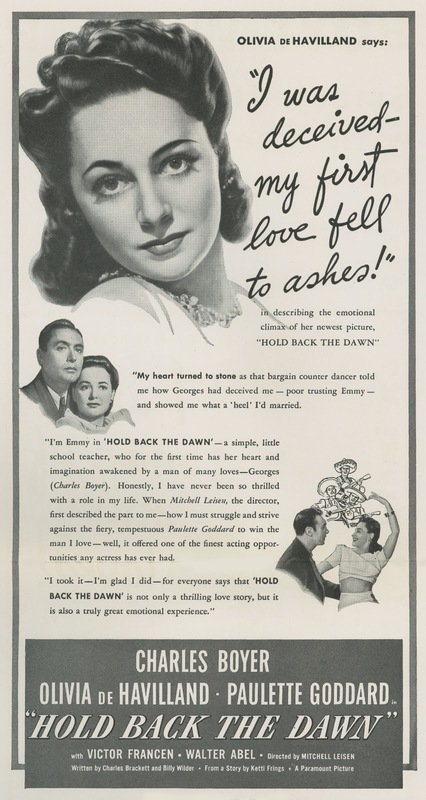 Hold Back The Dawn is about would-be immigrant and former gigolo Charles Boyer's effort to enter the United States by marrying spinster schoolmarm Olivia DeHavilland. 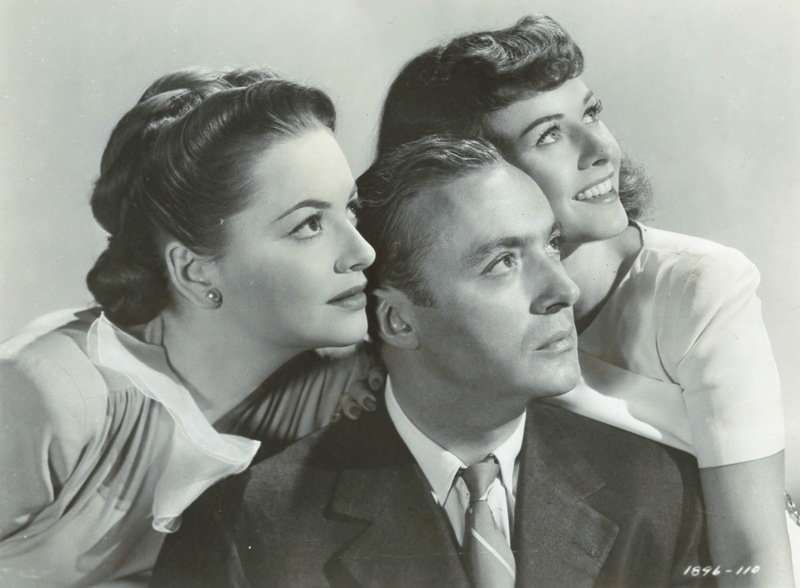 He's abetted by partner in love-piracy Paulette Goddard, she preying on rich men as he does DeHavilland. The script came via Charles Brackett and Billy Wilder, so verbal stingers are abundant, though Mitchell Leisen embraces sentiment Wilder might have ducked given the helm. This is a love story of unlikely events where it was for performers to put across credibility. DeHavilland's looks make us question her character's circumstance of never having known love, but as with The Heiress later, she was actress enough to close the sale. 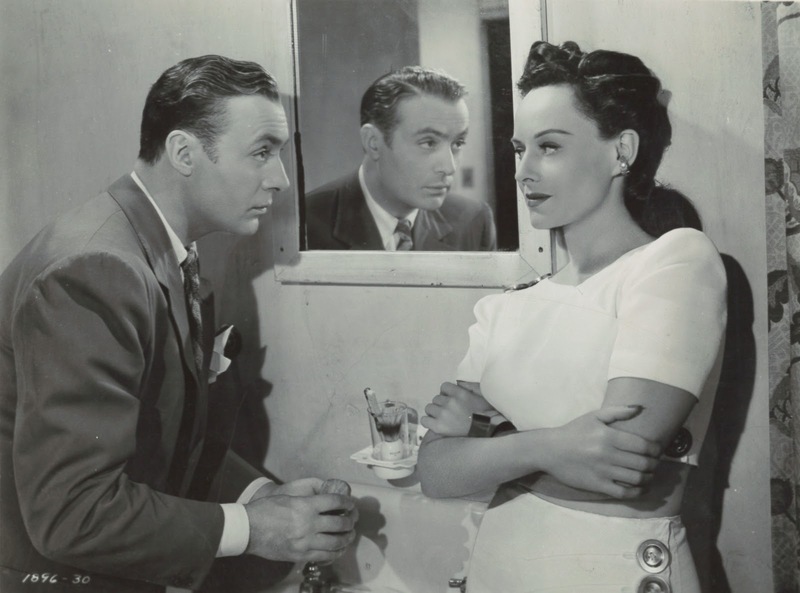 Charles Boyer is the continental lover which may seem too-familiar type-casting, but dialogue of the quality here, plus Boyer's customarily fine performance, pulls the role across to something quite effective. Maybe Wilder wasn't quite the cynic we thought, or more likely, censor edicts obliged his scruple-free characters going conscience-ridden for a third act to right previous wrongs. Even Chuck Tatum did penance for a first two-third's misbehavior of Ace In The Hole. 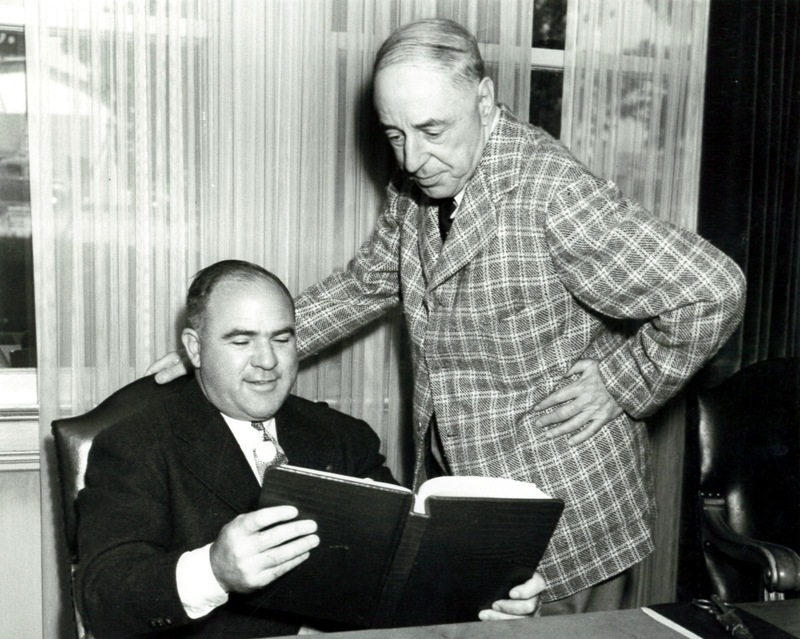 Hold Back The Dawn gets less interesting once Boyer turns Boy Scout, but even Wilder with Paramount and Leisen's support could not have overcome ingrained Hollywood convention. Mitchell Leisen has gotten legacy's worst for Wilder living longer and wielding the knife whenever Mitch's name came up during interviews. 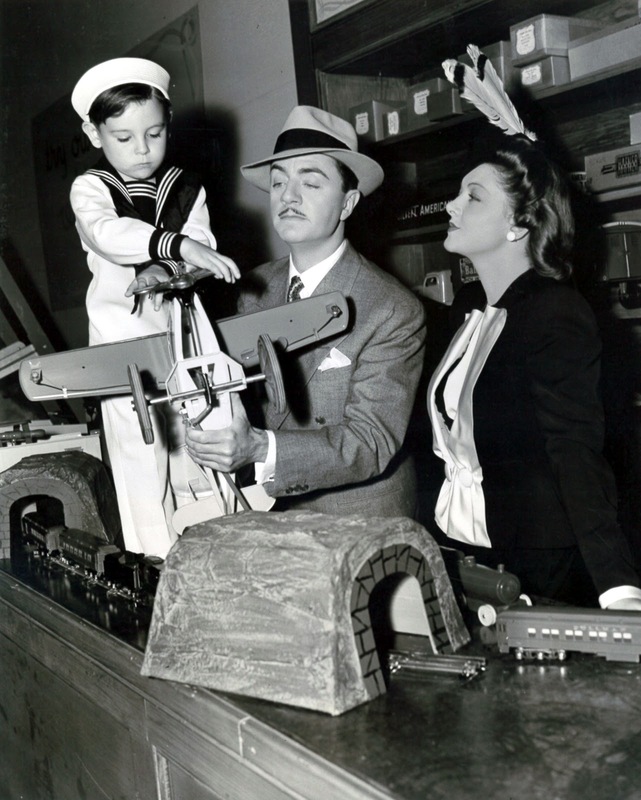 He said Leisen was a "set decorator" who gave in too easily to actors wanting script changes. Wilder could be nasty about presumptions like that, no matter that he was still a mere contract scribe when Leisen filmed he and Brackett's handiwork. Hold Back The Dawn isn't available in the US, but there is a Region 2 DVD of good quality. 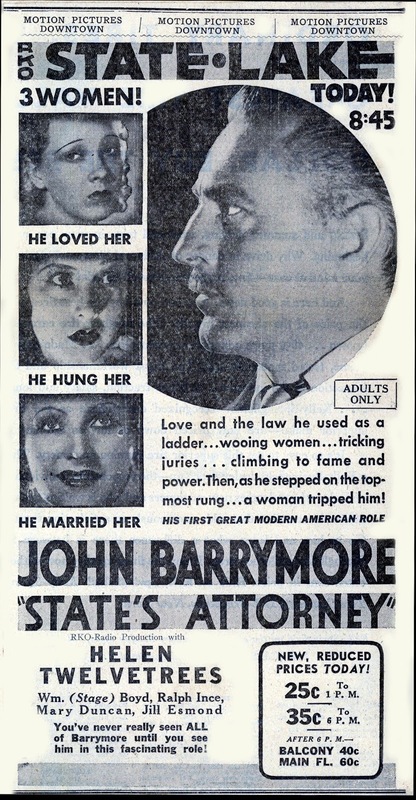 STATE'S ATTORNEY (1932) --- John Barrymore wired for sound as courtroom mouthpiece for boyhood chum William "Stage" Boyd, lately risen to crime lord status. Barrymore was by this time more effective as orator going to ruin than romantic leading man, alcohol having made steady inroad to the profile of profiles. His characters now with feet distinctly of clay, Barrymore could enrich State's Attorney and others with bravura when needed, pathos where appropriate, and mordant humor always at the ready. This was 1932 and final days of JB going long distances with dialogue, State's Attorney at twilight for a legend in full possession of thespic faculties. 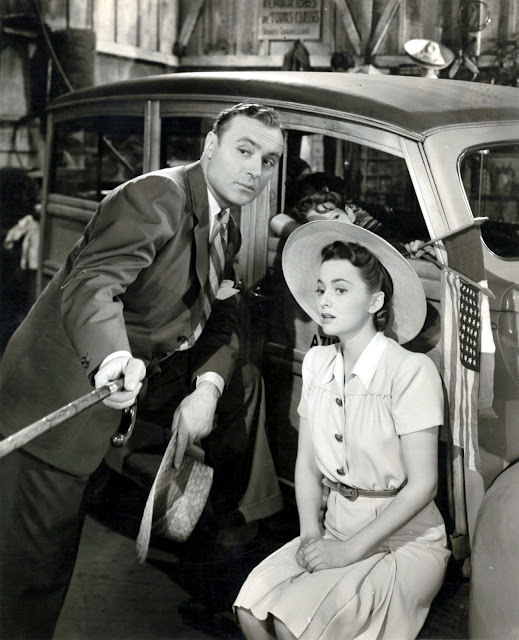 This also was a writer's movie, situations enriched by ring-of-truth Gene Fowler and Rowland Brown brought from checkered histories of their own (Fowler a Barrymore pal ... bet they got together on dialogue). State's Attorney scripting reflected lives eventfully lived. A following year's Counselor-At-Law, also with John Barrymore, earned greater laurels, and it's admittedly the better picture, but State's Attorney is plenty worthy and recommended on Warner Archive DVD. 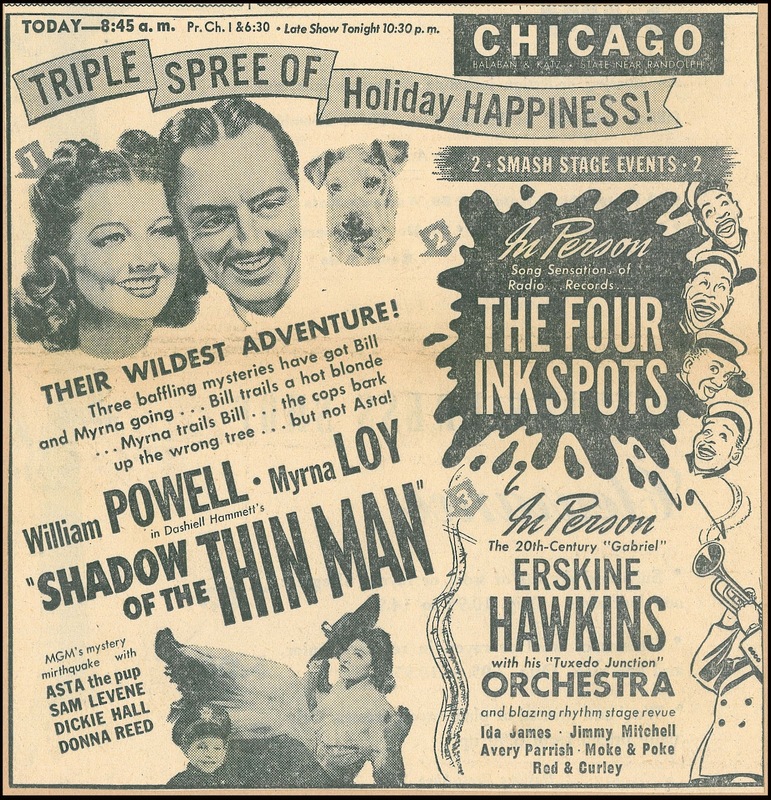 SHADOW OF THE THIN MAN (1941) --- The Thin Mans had slipped a long way by this one. I wouldn't hold against it the killer's identity being obvious from his first scene, but must there be so much Nick Jr. baby talk? Bill Powell downs three cocktails in the first reel, from which there's dissolve to him driving a car, surely disquieting even to 1941 audiences. W.S. Van Dyke directs not with punch he lent the first two (The Thin Man and After The Thin Man). Perhaps he'd given up by now and was content to do a bad job quickly. Powell must supply what amusement is had. Myrna Loy looked sleek before, seems overdressed here. Shadow's also twenty minutes too long. You can only admire MGM gloss so far. I watch because I love the idea of the Thin Man, but beware final four of this series. None will entirely please, and a few may let you severely down. TOMAHAWK (1951) --- I'm struck by how many peace pipes got smoked to disastrous result in 50's westerns, indian wars fought in greater numbers on screen during that decade than in all recorded history. Exhibitors cited fatigue with "too many redskin pictures," but outdoor action was surest to fill indoor and drive-in venues, thus continued profusion of it. Universal-International was most prolific. They made westerns on a conveyor basis, and what's surprising is a high standard, by their standards, maintained, despite sheer number done. 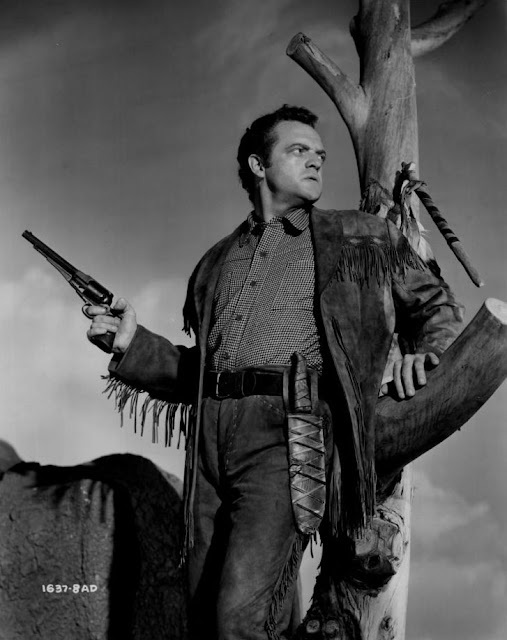 Tomahawk has an outside star name (Van Heflin) backed by on-lot talent in development (Alex Nicol, Susan Cabot, a single line for Rock Hudson), these in front of Technicolor cameras on pleasing location. Universal recognized color as means of differentiating their westerns from free stuff on television. Writing and direction would satisfy youth (lots of action) and not alienate grown-ups. These were strict formula, but not in a one-size-fit-all done by the yard at Republic and Monogram. In fact, UI's up-level cowboys nicely maintained energy levels of B's they'd supplant. 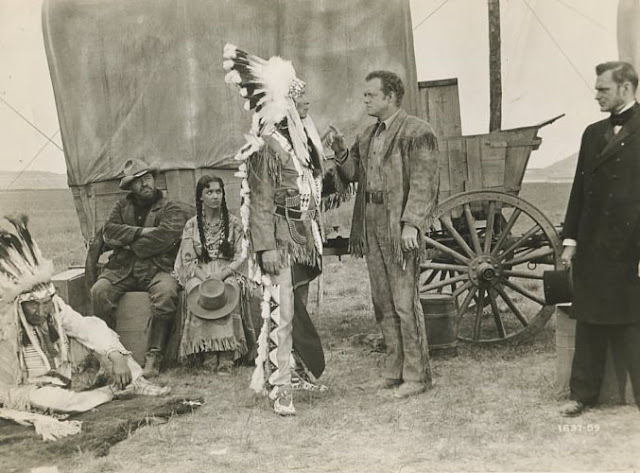 Horse falls and riding inserts I'd call breathtaking were taken for granted then, director George Sherman's a practiced action hand (when will he get credit overdue?). Now with Tomahawk playing High-Definition on satellite (Retro Plex), we at last get suggestion, if not full effect, of how it looked in 35mm. ONE MILLION B.C. 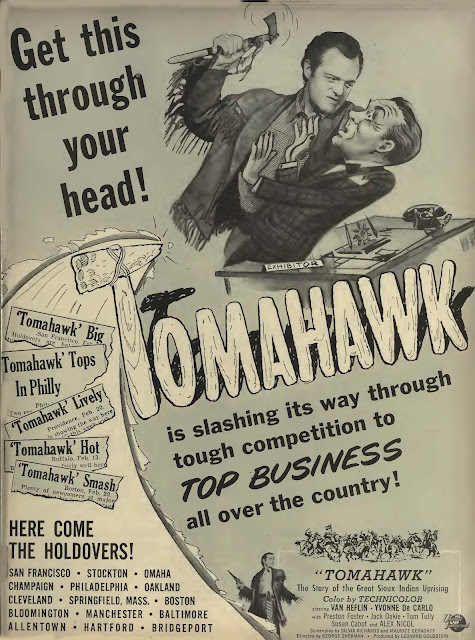 (1940) --- Hal Roach called this a dud, but I didn't find it so. Stone age narratives would seem to be among toughest nuts to crack, but One Million sprints along its 80 minute obstacle course. There's athletic newcomers Victor Mature and Carole Landis, plus blown-up lizards that would re-surface in countless low-budget sci-fi and adventure pics. Legendary D.W. Griffith was a for-while participant, on and off before principal photography began. Stills got made and spread around of he and Roach conferring. Come to think of it, One Million B.C. does have a certain Biograph-ish quality. Someone could write a monograph about B.C. stock footage turning up elsewhere over years to come, as late as theatrical features in the sixties! (see Valley Of The Dragons) Lon Chaney Jr. is the caveman patriarch. I read he wanted to apply his own makeup just like Dad, but union rules said nix. Should be on DVD, but isn't. Watched instead on TCM. It's been at least 45 years since I've seen One Million B.C., but my memories of it have always been fond. Maybe, seeing it now, I'd be dismayed at my youthful naivete, but your words on that score are encouraging. I remember sometime in the mid-60s, right about the last time I saw it, Forry Ackerman had a real coup in the pages of Famous Monsters: a picture of Lon Chaney Jr. in his own makeup design, the one the union wouldn't let him use. I also remember a story I read somewhere about Griffith on that picture. He screen-tested a number of starlets for the part of Loana the cave girl, the story goes, but the most important part wasn't what happened on camera. As part of the test, he took each actress outside the soundstage, pointed to a telephone pole some 20 or 30 yards away, and told them to run there and back. Carole Landis got the part because she was the only one who didn't run "like a girl". Too bad the Barrymore decline was so fast and so ... complete. Looking at him in his early pictures -- not only is the man beautiful, but his performances are always fresh and in some way contemporary. He was a genius, certainly, and if we only had him as an older leading man for a few more years, I think his legacy would be even greater. Fact: Billy Wilder and Preston Sturges both hated how Leisen worked with their words. I've always thought there was more than a little jealousy involved-- they wanted to direct by then, but were stuck watching Leisen do it so well they couldn't make a case for why they were necessary to do the job. I don't think the latter Thin Mans are all *that* bad ... They don't compare with the original film, but they certainly are as good or better than most of the detective programmers churned out by the studios at the time. At least Bill Powell was driving drunk in front of a process screen instead of a public thoroughfare. Always loved teaming up the old Castle Films ONE MILLION B.C. cut-downs with a print of the Hal Roach two reeler FLYING ELEPHANTS. Looks like they both used the same locations... Laurel and Hardy observing airborne pachyderms, Mature and Chaney looking at man eating iguanas. Stone age flappers looking no more anachronistic than prehistoric pin-up girl Landis. As to Wilder going soft in the final reel, I always thought the point of so many of B.W. 's greatest films (SUNSET BOULEVARD, ACE IN THE HOLE, THE APARTMENT etc.) was his protagonists lacking the guts to follow through on their cynical and/or exploitative convictions. Sort of an upside down Greek tragedy. Re: Barrymore-- yes, it's surprising that he fell so fast when you just have his performances to go on. One minute he's doing Counsellor at Law and Twentieth Century, the next he's playing support in Bulldog Drummond movies. But you don't really see on screen why. The fall in real life into utter drunkenness must have been so precipitous, and shocking to stuffy movie execs, because there's not really THAT much evidence, as distinct from his characters suddenly being that type, in his appearance and behavior on screen. As for Billy Wilder, I always thought--on the evidence of most of his films!--that he was a sentimental slob at heart, and liked to affect the airs of a confirmed cynic. But if you really want that you have to look to somebody like Luis Buñuel, you know? Certainly not Billy Wilder! His movies, like those of his hero Ernst Lubitsch, are full of life and sympathy. I always wish Nick and Nora never had the kid--that change alone is what torpedoed the series. "hold back the dawn" is unique in that it has the look and feel of a european film, and Paramount was - then, but not for much longer - the most 'continental' of hollywood film studios. Having Boyer and Wilder on board adds to that illusion, as does the plot construction and outdoors shooting, especially a charming scene when the car breaks down on the beach. Its been awhile since i've seen it, though comments on it in David Chierichetti's unputdownable 'Hollywood Director' are invaluable. 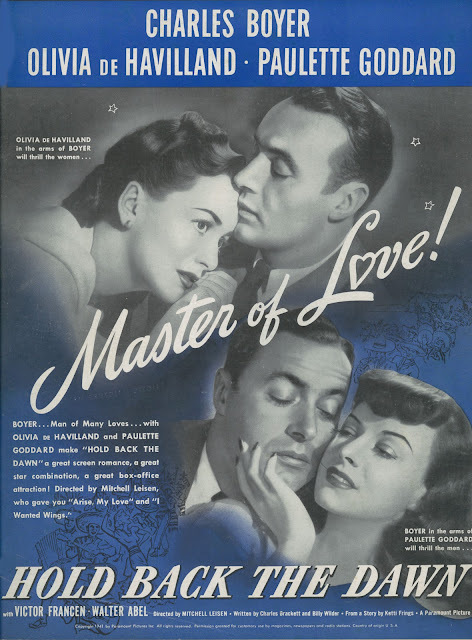 Most revealing of all is the contrast between deHavilland and Goddard as polar emblems of 40's 'womanhood', and olivia really could breathe life into 'sweet' leading lady roles, presumably because, in life, she posessed real mettle beneath her demure surface, while Goddard just seems to exude a sense of fun - till she ascended to top tier stardom and they tried to turn her into a dramatic actress. I'm really curious about the color piece alluded to by Craig, above. Yes, Chuck Tatum and Joe Gillis both repent in the final reel; and they both get killed for it. To me, that's true cynicism.